Convincing fresh-faced recruits to follow you into battle has always been an important part of the Mount & Blade series. In Mount & Blade II: Bannerlord, TaleWorlds is changing the recruitment process to give players more options, but they’re introducing new challenges as well. In previous Mount & Blade titles, you’d establish relationships with settlements. The games treated these as singular entities, assuming that a village as a whole will start liking you more when you lend a hand with the local bandit gang, for example. Establishing a good reputation with a settlement meant that they’d make some of their strapping young men available to recruit into your army. Prepare for battle with this list of the best strategy games on PC. But that’s going to change in Bannerlord, as TaleWorlds explains in a new devblog. Rather than having a relationship with a whole town, you’ll have to get friendly with key NPCs called notables. These are important people who have access to particular troops, and building relationships with notables will give you the opportunity to recruit soldiers directly from them. This has two important implications for your Bannerlords armies, TaleWorlds says. First, you’ll be able to replace higher-tier troops quickly if you know the right people, which means costly battles won’t necessarily be quite as crippling. But another interesting wrinkle is that AI characters are going to use this same system to build up their forces. In the past, your AI opponents would automatically regenerate troops over time, replacing casualties without any interaction with the gameworld. Now, they’ll be hitting up the same recruitment sources that you are, forcing you to compete for the loyalty of notable NPCs. 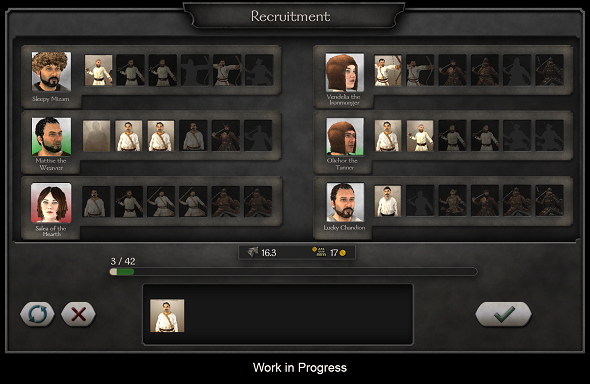 TaleWorlds provided a work-in-progress version of their recruitment panel to give us a sense of how it’ll work in-game. Tying recruitment to specific local leaders is an interesting idea on its own – maybe you don’t want to talk to the local chieftain, but someone else in the area trains excellent archers. But having you draw from the same well of new troops as your competition could make Bannerlord’s political game a lot more compelling as well. It’s not clear how this will tie in with the influence system TaleWorlds discussed last October, but time will tell. 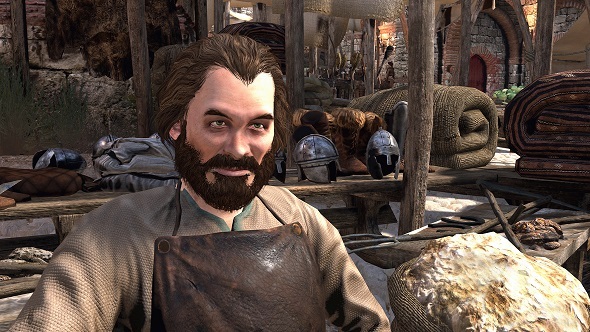 The big question for Mount & Blade II: Bannerlord is still “When’s it coming out?” There’s still no release date set though, so in the meantime we’ll have to content ourselves with mods for Warband.